This list was actually harder to compile than I thought it would be. Not that there wasn't any good music released in 2015, but I listen to a lot of indie bands and artists that haven't released albums yet. I've also been listening to a lot of old music from the 80s and 90s. But the main reason was that there were singles that were released that I absolutely adore, but I wasn't a fan of the entire album. This is the case of 25 by Adele, and this may be an unpopular opinion but I don't love the whole album. My favourite songs are Hello and When We Were Young, the two singles that were released. The same can be said for Made In The AM by One Direction. Some honourable mentions - Badlands by Halsey, Purpose by Justin Bieber and Chaos and the Calm by James Bay. I can remember my dad playing Coldplay when I was little and it was the only music of his that I actually liked at the time. They are now one of my favourite bands, their music just never disappoints. I actually had no idea they were releasing a new album and when I found out, I listened to it straight away. I'd say the album is a mix of good old classic Coldplay and their new techno sound. I've been a fan of The Weekend for a while now and I don't know why it took me so long to listen to this album because it's amazing. The Weeknd has such a beautiful voice and I just can't get over how much I love this album - I can imagine it being great live. When I found out that Troye was releasing an album, I was a bit skeptical because I wasn't the biggest fan of his first EP, TRXYE. I was however, pleasantly surprised and I honestly love this album. There is not a single song that I don't like. I first found Years & Years on youtube and the first song I heard of theirs was Take Shelter. Which, to this day is one of my favourite songs of theirs. I love Ollys voice and pretty much all the songs are up beat and are best listened to on full volume while dancing around your room (no shame). I am not one for rock music, but I have always loved Fall Out Boy. I was utterly obsessed with their last album, Save Rock And Roll and the same can be said for their most recent, American Beauty/American Psycho. The music is upbeat as always and I absolutely adore Patricks Stumps voice. I also love the music videos for Uman Thurman and Irresistible - I was laughing all the way through. The Neighbourhood // Wiped Out! I was a big fan of The Neighbourhoods first album, but I think I might prefer this one. I would say that it is more alternative and sounds amazing really loud through headphones. What were some of your favourite albums from this year? I'm really excited for The 1975s album coming out in February next year as well as Ed Sheerans third album hopefully coming out late 2016 (fingers crossed). I cannot believe I am already writing another series of yearly round ups. How is it December already? Each and every year seems to go quicker than the last. 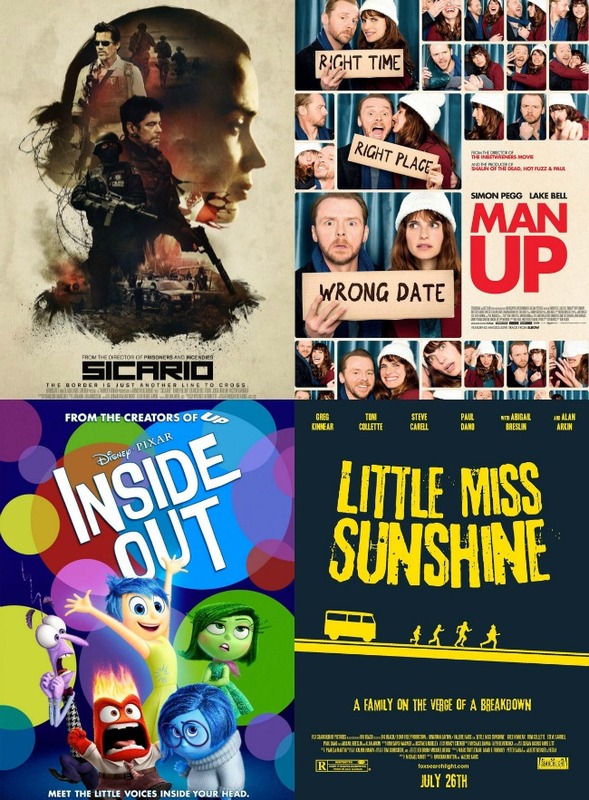 This years 'Best of' series will consist of TV shows, films, books and a new addition this year, albums. I was hoping that Game of Thrones would make it onto this list, as it is one of my favourite shows and featured in my favourite series from 2014. However, the newest season was pretty disappointing up until half way through. I also watched the first 4 seasons of Gossip Girl and it was alright - I didn't LOVE it. Nonetheless, this list is comprised of some really great TV shows that I enjoyed throughout 2015. I had a love/hate relationship with TWD until recently, and I can now say it is one of my favourite TV shows. For the first couple of seasons, episodes would either be a hit or miss but I feel Season 5 is one of the best seasons so far and the first half of Season 6 has been excellent so far. It is very slow paced and is not for the lighthearted - you are guaranteed to see some kind of rotting innards in each episode and it's great. The Office is one of the many series where I saw a gif set on tumblr and proceeded to watch the entire thing. I'm currently halfway through season 8 and have loved every minute. The first season is definitely the weakest and consists of just 6 episodes - you just need to get through it and the rest is brilliant. Jim is favourite character, and this might be my love for John Krasinski taking. Jim and Dwights continuous pranks on each other never fail to make me laugh out loud. I also thought Ed Helms was really good when he joined in season 3. I don't know what else to say other than it's great and you should really watch it if you haven't. I am also going to watch the British version once I'm done and I'm interested to see which one I prefer. I had heard so much about this series but held off because of exams and binged watched in two days. I can wholeheartedly say that it is brilliant. I am a big fan of Ellie Kemper from her role in The Office and Bridesmaids. The show follows Kimmy Schmidt (obviously), a bubbly and very enthusiastic young woman who is rescued after 15 years in a cult and tries to make it in modern day New York. It has a bizarre concept but it works, and it's unbelievably funny. The premise of Elementary is that it is modern day Sherlock Holmes living in New York. I absolutely love Jonny Lee Miller, who plays Sherlock - he does such a good job of the character. Something that makes this show stand out is that Watson, who has always been previously portrayed as a man, is female and is played wonderfully by Lucy Liu. Natalie Dormer (Margaery Tyrell from Game of Thrones) played a small role, but prominent character and she is great as always. This is one of those shows where they have a new mystery to solve every episode, but there is always an underlying and sometimes prominent storyline with the main characters. I think this is one of the most underrated series. There is not an episode where I am not laughing out loud at the hilarious antics that Malcolm and his brothers get up to. The acting is exceptional from the onset and throughout. I've been watching random episodes here and there but have managed to watch the equivalent of a couple of seasons. If you are looking for a new comedy series, definitely check this one out. It took me a couple of episodes to get into Jane The Virgin, but once I got into it, I was hooked. The show follows Jane Villanueva, a 23 year old engaged virgin, who is accidentally artificially inseminated. From then on, there is a series of intertwining plots and characters that calls for a lot of laughs and chaos. It can only be described as an Americanised Telenovela and it's brilliant. My favourite character has to be Rogelio, he is incredibly hilarious and quirky. What series have you watched and loved this year? 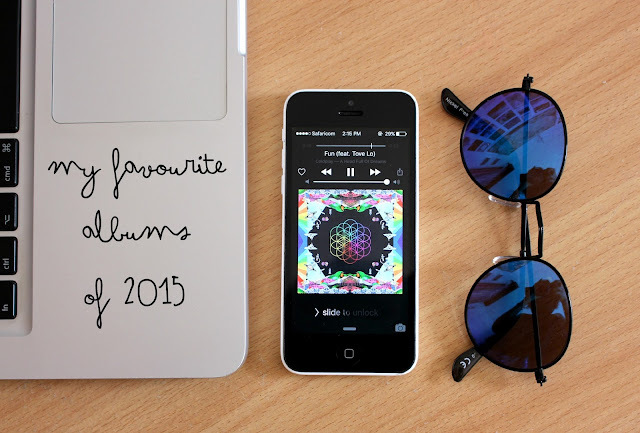 Check out my favourite series from 2014 here. 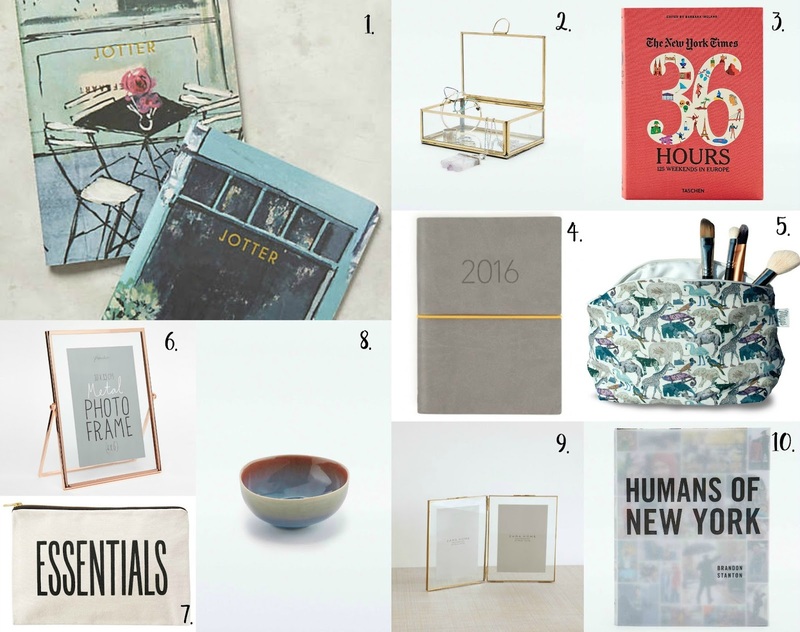 Christmas season is upon us and if you are a procrastinator like so many of us, here are some great 'lifestyle' gift ideas for friends or family. You can never go wrong with a photo frame if you include some personal photos of silly nights and fun adventures. Try this one (no. 6, £10) from Paperchase or perhaps this one (no. 9, £29.99) from Zara, both with a very minimalistic design. I've selected two options for jewellery storage - first, this glass box (no.2, £18) from Urban Outfitters and second, this trinket bowl (no. 8, £8) also from UO. Both are relatively inexpensive and gorgeous. The 'Essentials' (no. 7, £18) pouch and the Maggs London 'Grayson' (no. 5, £26.99) bag would be perfect as a gift for makeup on the go. Books are always a perfect present and the 36 Hours 125 Weekends in Europe Book (no. 3, £16.99) is great for someone who loves travelling. I personally love the Humans of New York posts and if you know anyone who does as well, this book (no. 10, £13) would be perfect. The Noto Grey 2016 Diary (no. 4, £12) is simple and would be a great gift for someone who is either organised, or wants to be. Lastly, these Jotter Journals (no.1, £14) are beautiful. Have you already done your christmas shopping? The story follows Eleanor and Park (obviously) who are two misfits that meet on the bus and bond over music and comic books in the 1980s. Eleanor has big red hair, is a little chubby with a wild fashion sense and a tough family life. Park is an outsider but not enough so that he gets picked on - he's just an all around likeable guy. Eleanor and Park was such a pleasure to read. 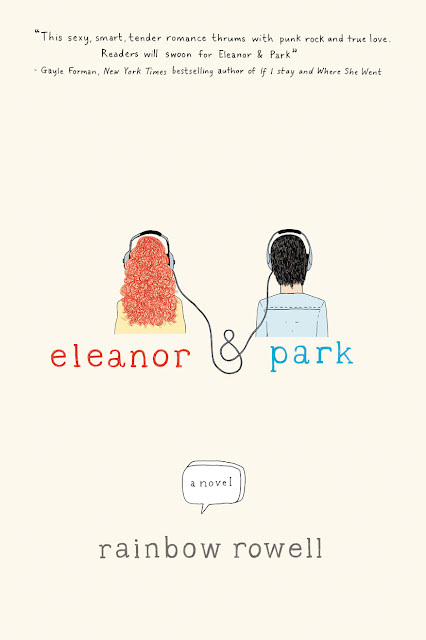 I loved the writing style and the fact that the narrative went back and forth between Eleanor and Park. It was interesting to see what they both felt about the same events as well as getting to know both of their living situations and family dynamics. I appreciated the fact it was set in the 1980s and the constant references to comics and music from that decade, that still manage to be relevant today. It is also a really easy book to read. I finished it in about two sittings and it would have only been one, but I needed sleep. Spoilers Ahead - Stop reading now if you haven't read the book. 1. I loved the element of multicultural characters. However, I felt like there was more room to highlight racism that was evident in the 1980s. Park mentioned his insecurities but we never saw any discrimination towards him. It could have been an interesting subplot of his character. 2. I loved Park as a character. I pictured him as a young Joseph Gordon-Levitt (think 10 Things I Hate About You). I also loved his family. His mum was really funny and the part when she gave Park a Christmas present to give to Eleanor and told him about her family in Korea was so sweet. I also loved how his dad really welcomed Eleanor into the family and was really understanding about her needing to leave at the end. 3. I thought it felt a bit rushed towards the end and I would have liked to have known what happened to Eleanors mum and siblings. Their fate was unclear - at first I thought they have left Richie, but then again, he was an abusive drunk and anything really could have happened. It's a bit far fetched, but all we were told was that the toys disappear from the front yard and they weren't seen anymore. 4. I've read some reviews and almost all say they hated the way the book ended - the postcard with three words on it. I genuinely liked the way it ended. I do think that Eleanor wrote 'I Love You' because she never actually tells Park she loves him. I read something that I completely agree with on a goodreads forum about how Eleanor finally told Park she loved him because she finally felt worthy and that it is a sign that she is healing, now that she is away from her horrible stepdad. Yet again, she could have just written 'stupid asian kid'. Have you read Eleanor and Park? What did you think of it? I am a big fan of the James Bond franchise and after the masterpiece that was Skyfall, I was really excited for Spectre, but was a bit sceptical before watching it because the reviews aren't great. Overall, I thought it was a very enjoyable film and the performances were all great. Christoph Watlz, who plays the villain was particularly brilliant and the scene where he was introduced was a masterpiece full of suspense. I would however, liked him to have had more screen time. The main issue for me was the script and somewhere along the way, it gets disconnected. Another problem I had with it is that it took away what I love about Casino Royale and Skyfall, being that those films took a step back from the classic Bond. In Casino Royale, a waiter asks Bond if he wants his drink shaken or stirred and he says "Do I look like a give a damn?". In Spectre, he orders his drink to be shaken. In Skyfall as well, Q gives Bond a gun and a radio and says "What were you expecting an exploding pen?". Again, in Spectre Q gives Bond an exploding watch. Do you see what I mean? I also didn't buy the romance between Bond and Lea Seydoux. Not enough time was dedicated to their relationship and when they confessed their love for each other, it just came out of the blue. For me, Spectre tries to make up for the weak plot with more action scenes. I did actually think the action scenes were brilliant though. It's by no means a bad film and and I really did enjoy it - it is well worth the four stars I gave it. 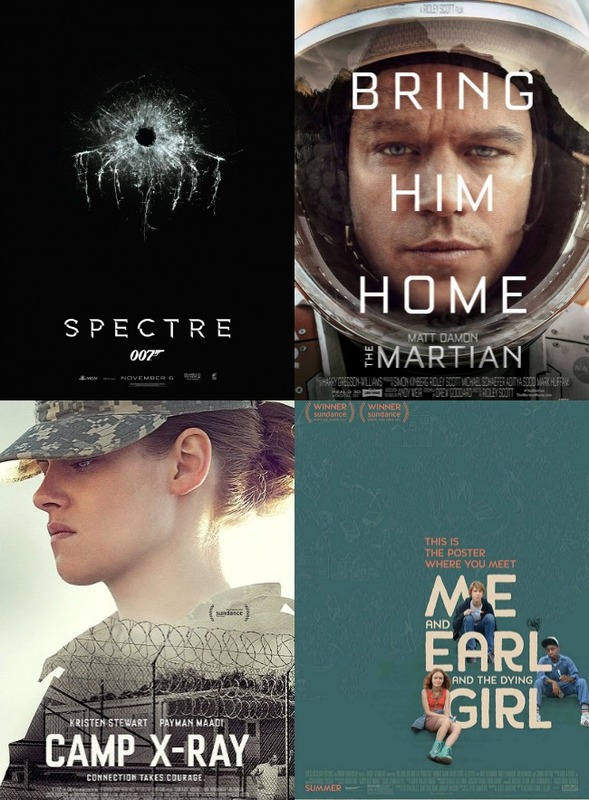 I found The Martian a lot more enjoyable than some of the recent space films such as Gravity and Interstellar. One reason being that it was surprisingly funny. That being said, there were also scenes that filled me with suspense and got be on the edge of my seat. I thought Matt Damon was great in this film and he played his character perfectly, who is a very likeable, smart and optimistic guy. There was no point in the film where I didn't know what was happening and the visuals were also brilliant. I am not a fan of 3D but it was definitely worth it. Probably one of the best films of the year and I'm eager to see how it does in the awards season. I've watched this film twice now and I can honestly say it is brilliant. Kristen Stewart plays a female guard at Guantanamo Bay and she forms an unlikely friendship with one of the detainees. I was pleasantly surprised with Kristen Stewarts performance as well as Payman Moaadi, who plays the very likeable detainee who strikes a friendship with Stewarts character. What I love most about this film is that it is something different - it shows that not everything is as black and white as it may seem. Its both funny, sad and very captivating and I highly recommend it. I hadn't heard much about this film before I watched it and was gladly taken by surprise at how much I liked it. It has a bit of a Fault In Our Stars feel to it, in terms of the poetic dialogue but it still managed to be original. It was really funny and all the performances were great. Nick Offerman is also in it and he was fantastic as always. I loved that the film just stuck to the theme of friendship rather than romance between the main characters, which makes it a bit different to most films these days. It was a very slow paced film and by no means has a phenomenal plot. Without the acting and cinematography, it would be your average drug bust film. It is however, incredible. I am a big fan of Emily blunt and this is one of her best works. This film is filled with suspense and is very dark, there is no scene that is hopeful. I left the cinema just dumb founded, but in a good way. Even though the film mainly follows Emily Blunts character, Benicio Del Toro steals the show. His character is so interesting and you never who he is working for or if he is one of the good guys or not. I loved the music which gave an amazing effect in the cinema and I really hope it translates well to DVD. The film follows Lake Bell as an awkward 34 year old who accidentally hijacks a blind date with Simon Pegg. This film has a bit of a cliche plot and it would be easy to discard this film into a collection of bad romantic comedies but its everything else that makes this film so great. The acting was brilliant, Simon Pegg and Lake Bell had great chemistry, the humour was just right and it was all around such a joy to watch. I particularly loved Lake Bells character, she was so unapologetically herself and a very realistic, funny character. It's not a groundbreaking comedy film but it is hilarious and I guarantee you will enjoy it. I heard nothing but good things about this film when it first came out but I wasn't rushing to the cinema to watch it. There are just some films that are not cinema films. And when I got around to watching it, I really enjoyed it. I actually found myself laughing out loud at parts. It was a bit predictable, but then again, it was made for kids. The main reason I really like the film was that it had a really prominent message about depression. I also really loved how everything tied together with all the memories and subplots. Overall, it was brilliant and can't recommend it enough. I remember watching this film when it first came out and I think I was too young to enjoy it properly and get all the jokes. And because of that, I had the impression that the film wasn't great and never watched it again. Recently, Jack Howard mentioned it as one of his favourite films and I thought I had to give it another go, and I loved it. I'm sure most people have watched it but if you haven't, its about a very dysfunctional family going on a road trip to California to support young Olive in a bid to win the Little Miss Sunshine Pageant. I thought all the characters were the right about of quirky and were also well rounded and likeable. It's a real feel good film eventually after lots of mishaps and has just the right amount of humour and heart-felt moments to make it great. Have you watched any good films recently?